James Monroe Museum Political Cartoons | Shipmates! Yo-Ho-Ho and a bottle of...power? This cartoonist is comparing United States senator John L. Lewis with Hitler because both men were against major social reform. 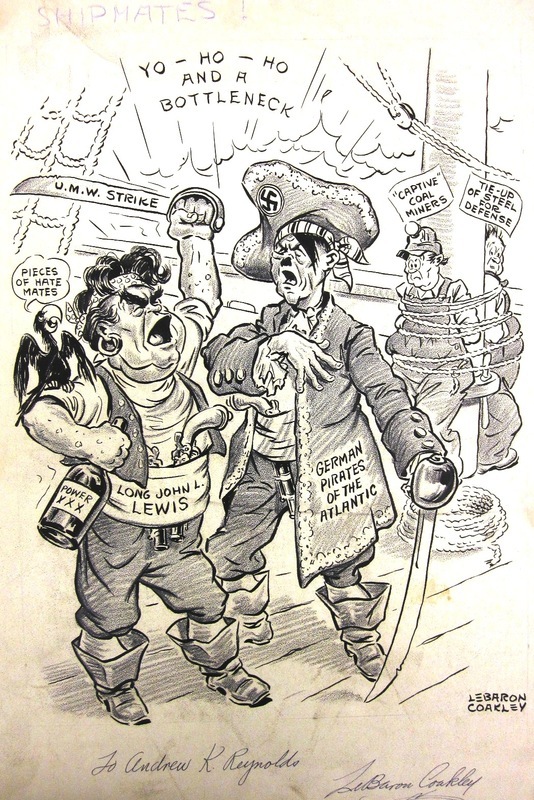 Lewis was a strong opponent of Franklin D. Roosevelt’s New Deal policies and his hatred for the coddling of the working man is comparable to Hitler’s own, according to this artist. United Mine Workers of America, UMWA History, http://www.umwa.org/?q=content/john-l-lewis (accessed April 20. 2012). Lebaron Coakley, “Shipmates!,” James Monroe Museum Political Cartoons, accessed April 19, 2019, http://jmpolitoons.umwhistory.org/items/show/107.